This is reunion week at my alma mater, Reed College. In a previous blog I posted a short piece on two Reed-related publications that now fall into the realm of local historical foodways documents: Jay F. Rosenberg’s The Impoverished Students’ Book of Cookery, Drinkery, & Housekeepery (1965) and The Essential Ingredient (1973), compiled by Reedies David and Margaret Mesirow and others. Cheap Meals reveals the truth that, fifty years ago, Portland was far from being the foodie haven it is considered to be today. Caffee Trieste was the sole noted outpost of coffee culture: “Loses. Espresso 20¢, cappuccino 25¢. … It just isn’t very good.” Hamburgers? 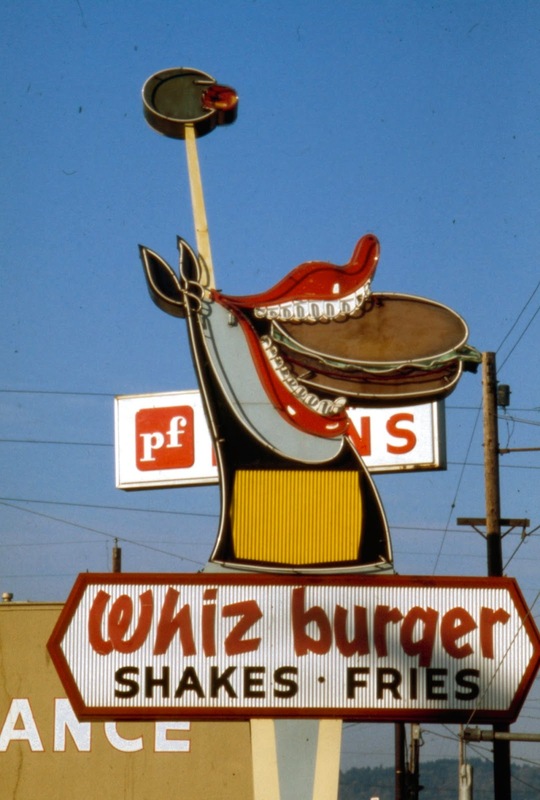 There are capsule reviews of three places on Powell Boulevard: Waddle’s Charbroiler (“… you can pile on as much pickle and other junk as you want”) and a McDonald’s (”Soggy fries”; McD’s is still there), and the late, lamented Whizburger; the lamented loss, however, is of the sign, not the hamburgers. Peter G. Lomhoff ’66 is now an attorney in Oakland, California, specializing in elder law.